Star Trek: Into Darkness is, in many ways, both an incredibly old fashioned film and a riveting contemporary slice of cinema. Tonally the movie is not too far removed from the cheap, populist, larger than life science fiction B-movies which preceded the original Star Trek series and, in their influencing of George Lucas and Star Wars, have accidentally become amongst the most influential features of all time. Yet, simultaneously, the feature is also one of the most technically advanced films to have been created in years; perhaps the first mainstream movie to successfully incorporate 3D in a manner which was not grating. Watched in IMAX too, Into Darkness is an awe-inspiring site emphasising what a wondrous spectacle cinema may be. It's a film which tips it's hat to schlocky trash of the past and the vast excesses of modern blockbusters, bearing with it the curses and blessings of both. Into Darkness kicks off with the twenty first century Kirk - a smug jock who thinks nothing of breaking rules, partially because he believes them overly restrictive to doing the right thing and partially because of an unfounded sense of entitlement. His confidant is the ice cold Spock who prefers reasoning to emotion; in many ways he's a humorous re-imagining of Gordon Brown (which I guess would make Kirk this film's Tony Blair). Their differences are put aside when an act of terror means that the Enterprise crew have to give chase after the mysterious John Harrison (a startling Benedict Cumberbatch) who always seems to be three or four steps ahead of his pursuers, even in moments when he appears vulnerable - he's an Ali playing rope a dope or Bobby Fischer playing chess with the Star Trek crew as his pawns. Keeping up with his games is exhausting and it soon becomes clear that perhaps even his identity is not as cut and dry as once thought. Over the course of the film, J.J. Abram's takes great pleasure in composing a series of high octane spectacles including cross-galaxy chases, a series of fist fights and the obligatory beaming up of a character or two. The action is perfectly fluid, the C.G.I. barely pulls one out of the picture and aesthetics-wise, its as close to perfection as any sci-fi blockbuster so far made. Yet, the thing which holds the feature together are the fantastic performances by Zachary Quinto, Chris Pine and Benedict Cumberbatch in particular. The English actor portrays the menacing Harrison somewhere between an alien Hannibal Lecter and Robert Patrick's T-1000. There will be no performances like it on screen this year and, were roles in blockbusters better represented at awards season, the Sherlock actor would surely have to buy an extra cabinet or two. This is not to say the film itself is perfect, far from it. The score which underpins this latest offering from J.J. Abrams is as loud and as evocatively brash as anything John Williams could compose and each note is used to hammer home the exact emotion the audience should be feeling at any given second; subtlety and subtext are not this movies' strong point. At points it feels not like Abrams is trying to manipulate the audience towards feelings per se but that he believes we won't understand what's going on without heavy handed guidance - this is the only explanation for a jaw-dropping voice-over at the end by Kirk which explains to us the moral of the story with all the nuance of a 1980s He-Man cartoon. Most troubling of all, however, is the impression that none of the film-makers had ever previously met a real life woman in the flesh. 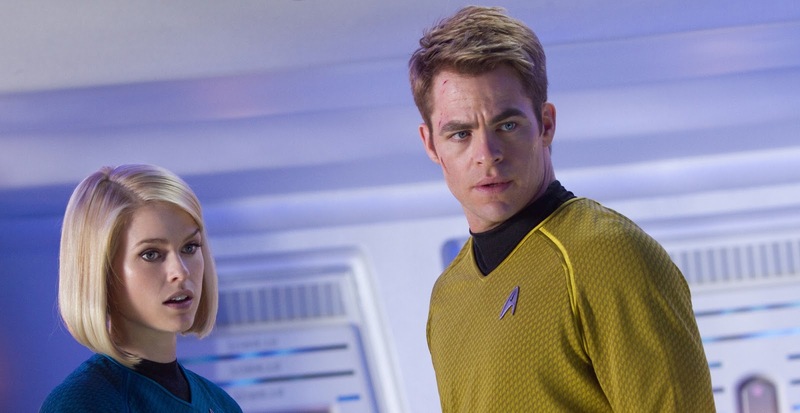 Zoe Saldana and Alice Eve both appear in Star Trek but neither really have a character or role of any description. Eve, in particular, has a sorry part - the main reason for her appearance, it seems, was to strip down to her underwear for a couple of seconds screen-time so this imagery could be used in the movie's marketing. Despite one of the writers apologising for this gratuity, it is something which leaves a sour taste in the mouth and shows that despite its wit and invention, the main reason that Into Darkness exists is not because anyone involved had a tale they were dying to tell. Rather, it was made because there were profits to be had. Overall, it's a fun, perfectly crafted film put together with great craftsmanship, but the contempt for the audience's intelligence and females in general tarnishes what could otherwise have been a rather exhilarating movie. Hopefully the writers will be as progressive and forward thinking in their approach to characters as they are to technology come the inevitable next outing of the franchise.